Why Da nang beach is called China beach? VietNamNet Bridge – The name China Beach appeared from an American television film. In this film “China Beach” was the name of Da nang’s My Khe beach. Since then, many tourism websites have used this name. The film, “China Beach,” was aired on ABC from 1988 to 1991. It told a story about the evacuation of a hospital during the Vietnam War. The film’s title “China Beach” referred to Da nang’s My Khe beach. During the Vietnam War, My Khe beach used to be a resort of American soldiers. Americans called this beach as “China Beach.” This is why the above TV film was entitled “China Beach.” The film was shot in the US but the producers built a similar beach to My Khe at their studio. From this film, the name China Beach has been popularly used on many Vietnamese and foreign websites, to demonstrate the My Khe beach in Da nang, Vietnam. 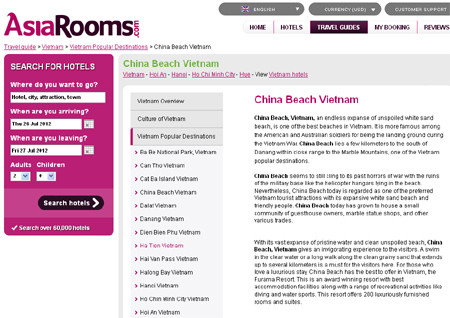 After the Ministry of Information and Communications threatened to close Vietnamese websites that use the name China Beach in place of My Khe beach, most websites of travel firms in Vietnam have replaced China Beach with My Khe beach. However, the name is still available on foreign websites.